Agromin CEO Bill Camarillo was part of a panel discussion at the 2016 Regional Conference & General Assembly of the Southern California Association of Governments in La Quinta this month. The topic was "Waste Not, Want Not--How Innovation, Policy and Legislation are Changing the Industry." The panel discussed how new technologies are helping local governments comply with new legislation and to sustain their constituents' quality of life. The panel explored the new face of recycling and how reuse makes green sense for sustainability and the economy. 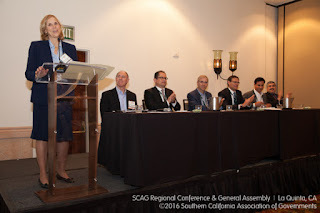 The session was sponsored by San Bernardino Valley Municipal Water District and was moderated by Councilmember Margaret Finlay, City of Duarte. Joining Bill on the panel were Jim Ambroso, Managing Director/Western Region, Anaergia, Doug Headrick, General Manager, San Bernardino County Water District, Richard Nino, Vice President, Burrtec Waste Industries, David Siegel, Consul General of Israel and Nate Taylor, Market Development Project Manager, Southern California Gas Company.